After a well received version for iOS, Construction Simulator arrives to Android. It is available for smartphones and tablets in the Play Store and Amazon App Shop for Kindle – Edition. Have you ever dreamed of driving a bulldozer, a truck carrying construction material or to operate a concrete pump? This is your chance. 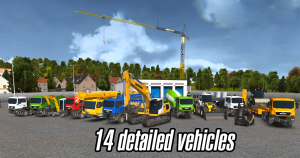 With this game you can control up to 14 different vehicles from LIEBHERR, MAN and STILL. You start the game with four basic vehicles. 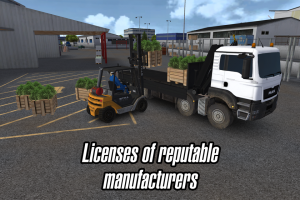 Starting with easy missions, learn to drive and work with different types of trucks, excavators and other vehicles. The missions provide us with money that we can invest in upgrading our fleet of vehicles. The difficulty increases as we move forward, and we will need more specific machinery. There are two types of control for each vehicle, depending on whether it is in drive mode or in work mode. When we need to drive, we will have a GPS style map position to guide us through the city. Outside the city, there are a factory, a gravel pit, and a sawmill, while inside there are the builder’s merchant, where we can buy the materials we need, the harbor, and our business. When we need to work with a machine, we have a new control panel that allows us to control it easily and efficiently. Construction Simulator 2014 is available for iPhone (4, 4S, 5, 5c, and 5s), iPad (2, 3, 4, and Mini) and Android 4.0.3 and up. You can purchase the game for $2.99 in the App Store, on Google Play, and Amazon App-shop respectively.